The scientific name for Butcher's Broom Root is Ruscus aculeatus. As far as we know, Butcher's Broom Root does not appear to have many aliases. Another name it does go by, however, is Asparagaceae. The fact that there are not several names for this herb is encouraging, as it will be less confusing than many other herbs on the market today. The plant itself is not wasteful. The parts used for medicinal purposes include the entire plant, root and seeds. That fact is not necessarily unusual in herbal plants, however it should be appreciated, as many herbal plants do not produce a large quantity of useful medicinal substance. Amazingly, 20-30% of the people that go on the operating table in the US either die in the operating room or die in recovery afterwards. The major cause is thrombosis (blood clots). In Europe, where Butchers Broom is used extensively, thrombosis in those operating rooms is a rare and unusual incident. Butcher's broom may be a wise choice when we consider the fact that circulatory problems are the #1 killer in the United States. On patients with post-operative tendencies toward circulatory problems like thrombosis, butcher's broom exhibits a constricting action on the veins, making it most effective. Butcher's Broom acts on the blood vessels by stimulating the release of norepinephrine, which then produces a vasoconstriction effect. The production of norepineprine lengthens the time required to clot the blood and thus explains its use in preventing post-operative thrombosis. Butcher's Broom inhibits the formation of blood clots and will also help to dispel them. Other uses for Butcher's Broom include the fact that it reduces inflammation, is useful for carpal tunnel syndrome, circulatory disorders, edema, meniere's disease, obesity, raynaud's phenomenon, thrombophlebitis, varicose veins, and vertigo. This herb has also been proven good for the bladder and kidneys. On a random, but useful note - Butcher's Broom Root is more effective if taken with Vitamin C.
Bodily Influences of Butcher's Broom Root: Anti-inflammatory, aperients, astringent, deobstruent, diaphoretic, diuretic, emmenagogue, laxative, prevents blood clots, vasoconstrictive. Butcher's Broom is also useful in pregnancy and for people who stand for lengthy periods of time. 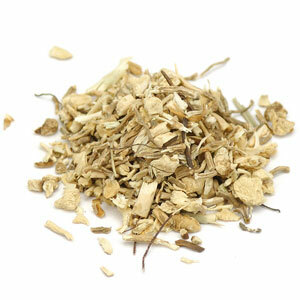 Butchers broom has been very beneficial for hemorrhoids also. Contains anti-inflammatory properties, as well as having the characteristic of strengthening the walls of the blood vessels. Butcher's Broom has been beneficial for improving peripheral circulation, while also increasing circulation to the brain, legs and arms. It has a diuretic effect, causing the constriction of blood vessels while also lowering cholesterol. Beta-carotene, chrysophanic acid, glycolic acid, neoruscogenin, rutin, saponin. Ritchason, Jack N.D. The Little Herb Encyclopedia. Woodland Publishing Inc., 1995.